My daughter Anica is beautiful, ruthless, and ridiculously smart. She embodies every connotation of the word precocious. Sometimes, Anica gets bored and messes with me. Me: "I'm thinking of an animal that's black and white." Anica: "A cow!" Me: "AND it has wings and swims very well." Anica: "A birdcowfish!" But that's just her playing around. Recently, she got ruthless. Anica: "I'm thinking of a duck. What is it?" Me: "Um..a duck." Anica: "No. Do you want to know what it is?" Me: "Yes." Anica: "It's a duck." Trying to outsmart her is futile. Anica: "I'm thinking of a panda." Me: "It's a panda." Anica: "Nope." Me: "It's a panda." Anica: "No, it's a duck." Even when she takes pity on me. Anica: "I'm thinking of a cow, which means it's something else." Me: "How do I know?" Anica: "Guess!" Me: "A duck." Anica: "No, it's a dog." Even when it's my turn. (...cont) Anica: "It's an eel." Me: "No." Anica: "Yes, because it looks like a snake." Me: "HOW DO I WIN THIS GAME?" At least my daughter still has one shred of compassion. My only hope, at this point, is to curry favor for when she rules the world. Q&A: Gold Novella available anywhere else? Sigh... Are you planning on selling "From the Depths" on any site at all, separately from other guys? So first, the Gold novella was written as a work-for-hire, which means all the rights to it belong to inXile and not to me. So "I" (Adam) will not be selling the novella anywhere because contractually I cannot. "We" (inXile) do not currently have any plans to sell the Gold novella -- nor the other novellas in the From the Depths compilation -- in any way beyond how you can get them now. That doesn't mean we won't sell them on Amazon or something after Torment ships, it just means there are currently no plans to. I will say that $15 for seven novellas is a pretty good deal, especially with some of the authors involved. If you're at all interested in Torment or in Numenera, I'd say (biased though I am) that it's well worth it. 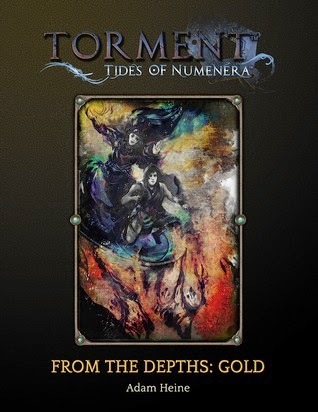 As part of the Kickstarter campaign for Torment, we offered a series of give novellas called From the Depths. The novella I wrote (the Gold one, with super secret hidden title Gate to the Abyss) has been published and is available now. This marks the second time I've been published (for anything greater than 25 words, that is). Still no novel, but I'm working my way up there! And look: I have two fans! The enemy of your enemy can still kill you. After the destruction of Shuenha, Luthiya and the other survivors take refuge in a dessicated land of churning volcanoes and eternal night—the ruins of Ossiphagan. They endure, but barely. So everyday they search the ruins, hoping to find some powerful artifact that will avenge them against the bloodthirsty Tabaht. Luthiya discovers the fire wights, an ancient race both beautiful and powerful. She's afraid of them, but when the wights scare off a Tabaht scouting party, the other refugees believe they've found their redemption. But are the wights all they seem? Can they be reasoned with or are they bloodthirsty animals? More importantly, are they working alone? If you pledged for a reward level that includes the novellas, you can log into our website and download the novella right now. At this moment, pledging towards Torment is the only way to get the novella. If you'd like to do that, you can pledge toward any of the reward levels that include the novella compilation (the cheapest being just the novella compilation at $15.00). You can do that on the Torment website as well. As you said, you want neither to encourage nor prohibit save scumming. We haven't finalized our game modes yet by any means, but we are tentatively planning some sort of ironman/permadeath mode. Of course "permadeath" doesn't mean as much to a tough-to-kill castoff of the Changing God, but it would mean something for your companions. Last week I got critiques back on two of my novels. They were great critiques. I mean really great, like editor-from-Tor great. (Don't get excited. They were not from an editor at Tor, nor any other Big 5 publisher; I'm still very much in submission hell.) And this super-editor critique, that I'm extremely grateful for and will probably owe my future career to, well... it totally and utterly crushed my soul. For two days straight, I was the authorial version of John McClane's feet. I knew I could write in theory -- I mean, people have said so before and even paid me for doing so -- but I couldn't make myself believe it. I didn't feel right reviewing other people's stories or even Torment docs. I felt like I knew nothing about telling a story or stringing words together. I am not a great writer. But damn can I revise. Twisting it that way changes everything. If I think I can write, but then I get this critique that rips through my novel like a chain blade through a clan of ninjas, then surely I know nothing. I'm a pretender, a wannabe, and I will never get it right. But if I consider myself a reviser, then a critique like that is expected -- desired even. It's just more ammunition to do what I'm really good at. Everything I write is going to get critiqued that hard, so it's a damn good thing that I can revise anything. Don't get me wrong, the critique still hurts, and it's going to take a lot of work for me be happy with it again, but thinking of it that way gave me back the motivation I needed to tackle it. This is something I can do. A: "Help! There's a murderer on the loose!" B: "No there isn't. You're just making up that murderer nonsense to get attention." A: "What? But... dead bodies. Murder. Facts." B: "Fabricated. I mean, look how obviously these pictures have been photoshopped." A: "These pictures are from the NY Times. One of the bodies is right over there. Someone is murdering women." B: "Now you're blowing everything out of proportion. They're not murdering women. They're murdering men, too. But you don't see me complaining about it." A: "Complaining? I... Look, I'm not saying men haven't been murdered. I'm saying the killer is primarily stalking and killing women. Even most of the men he's murdered were because he accused them of being women. Why are you arguing about this?" B: "Oh, so now you're blaming me? I didn't murder anybody! You need to get your facts straight. There are a lot worse things than being murdered, you know." C: "Hey, I heard you're trying to raise this issue about women getting murdered again. I thought you were a rational person, but I guess I was wrong." D: "Woah! Stop blaming us for the murders! I interact with women all the time without murdering them!" E: "Oh my God! You're not talking about this 'murderer' again, are you? Shut the f*** up!" Of course I'm not actually talking about a murderer. It would be so much simpler if I were. I'm referring to online harassment, stalking, threats, and severe sexism -- particularly toward women, particularly in and around gaming culture. A recent public example being Anita Sarkeesian, who was stalked and driven from her home by abuse for bringing up the objectification of women in several mainstream games. I wish it were the only example -- if it were, maybe then we could talk about whether it actually happened -- but it's not even close. The most horrible part about this conversation is that there are now two problems. There's the "murderer" who is actively killing people (Oh no! Facts! Don't look directly at them! ), and there is this small but ridiculously vocal group of people shouting down everyone who tries to do something about it. Look, I can understand if you don't see the problem. Twenty years ago, I didn't see the problem either, and it was another decade after that before I saw just how prevalent the problem really was. By its very nature, the problem is invisible to us. But you have to understand that when you argue with the victims, it makes you a part of the problem whether you see it or not. This is not a blame game, though (making it such is also a part of the problem). It isn't about you at all. We're probably all sexist at some level, but it's not about labels either. It's about this: what will you do when confronted with people who are hurting? Will you argue that, hey, it's not all men? Will you throw up your hands because that's life and there's nothing you can do? Will you cuss out the person who dared to accuse you of the systemic discrimination that influences every single person on the planet? Or will you own up to the problem, see it for what it is, and try to minimize it in yourself? Will you try to help and try to do better? That's what this is for me. The point of this post is not to argue whether or not this crap happens (please don't, it makes you look dumb), but for the people who are where I was, who aren't aware of the problem and its extent, who don't realize that they are part of the problem but that there is something they can do about it. Because it is a problem. This murderer makes gaming a toxic environment for many, and several times worse for women than for men. And the second problem: a group who, while perhaps not murderers themselves, make it very difficult for anyone (though again, especially women) to try to talk about this problem. Discussion and awareness are key to any kind of progress, and while the harassers are extremely good at raising awareness (nice work, guys), they are less good about rational discussion. What can we do? Talk about it. Read about it (you've got 9 good links right up there, most of which link to more good links). Post about it. Call it out when you see it, and don't play with people who do this sort of thing. God, that last bit is the kind of thing I say to my 7-year-olds. But you know what? When we do or allow this sort of thing, that's exactly what we're acting like. It's way past time we grew up. So I lately got Numenera corerulebook and bestiary and read them through, fascinating stuff, but It makes me wonder about the video game. I mean, when you are doing normal fantasy game setting, you can just include vampires and skeletons and whatever without thinking about it too deeply, but in numenera straight up magic doesn't even exist, everything is caused by really advanced science and bestiary doesn't contain any monsters from traditional fantasy setting. Heck, book even recommends against using words like dragon or griffon or such to describe creatures. So yeah, does that make job much harder for you guys or do you guys consider it more of opportunity to do interesting things?